The path between our Selva apartment and Vallunga. We hadn't been in the Italian Dolomite village of Selva di Val Gardena but a few days when we realized we'd made a big mistake--we should have arrived a week earlier so as to have a 3 week stay. Our apartment only opened for the season 2 weeks before the onset of high season rates and we'd foolishly let their schedule dictate ours. Selva is our absolute top pick of places to be and clearly we should have planned a longer visit. Perhaps it was the bad economy or perhaps the death in the family of the owners late last fall that had determined their later-than-usual opening but regardless, in 2010 we'd be there earlier. As soon as we could see our error, Bill began scrutinizing other apartments that had opened earlier. Not all of the cable cars would be operating and the weather might be even cooler and wetter than what we were experiencing, but that didn't matter. We could easily entertain ourselves with low elevation walking, even in the rain. Hopefully a 3 week stay would have us departing with a better sense of closure than we had this year. We'd stashed our bikes and extra gear in the Selva apartment building's ski room for our 2 night rifugio stay and when we returned 85 year old Rosa again lavished us with her hostess charm. A box of chocolates was our departure gift this year; last year it was a wooden ornament. She emphasized how disappointed her daughter Susy would be if we didn't stop by their 4 star hotel to say good-bye. It was hard to imagine that saying goodbye to yet another pair of guests passing through the revolving door would be anything but a nuisance but we obliged. Susy asked about our travel plans and even though we were spending the night at a competitor's B&B, she invited me to use the hotel's swimming pool one last time. As we left, she urged us to call her if we were in need of help while in the region--an unexpectedly generous offer. We receive such offers of assistance less than once a year and we treasure them. We'd never taken anyone up on this kindness but when we've been in a bind the offers immediately pop on to our list of options. Perhaps we too would be limited to Vallunga meadow walking. As we huffed and puffed up the very steep winding road at the upper end of Val Gardena, I once again took my last long look at Selva. Each time we leave I pause and hope that it won't have been for the last time. I hope that we will indeed return again and again, even if not on bikes. Bill has his eye on Selva for our old age. He has visions of being like the Italian elderly we've seen strolling from bench to bench in town or sitting in Vallunga's meadow; people who no doubt hiked in the mountains for decades and slowly have been confined to increasingly less strenuous experiences but they keep coming back. Despite our sadness in leaving Selva, I knew that pleasant times were ahead of us in Corvara. 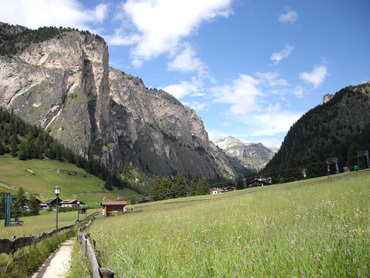 The views, the hikes, the walks, the accommodations wouldn't be quite as nice as Selva, but Corvara allowed us to escape Selva's high season prices and to literally have a change of scenery. Once we recovered from the disappointment of leaving Selva's charm, we'd have a fine time there. But this day tinged with a sense of loss unexpectedly became buoyed by it becoming a social day. About an hour into our climb, one of our pauses to catch our breathe became a protracted conversation between Bill and a pair of German roadies. The scant bit of shoulder didn't make it easy for me to join in the conversation, so I went on alone. Along the way another rider slowed enough to quiz me about my load and nationality and to complement me on my fortitude--a bit of attention that was a sweet change from the usual solitude of riding. Corvara & its valley, Alta Badia. One of my pauses that served double duty in giving me a little rest and allowing Bill to catch-up became a long conversation with a Spanish couple. Bill arrived in time to set them straight as to how to see the best of the Dolomites in their rather rushed, 7 day driving tour of the eastern Alps. A Belgium woman a bit our senior had apparently been itching to talk touring with us as when the Spaniards drove off, she marched over and continued the conversation about bike travel. It seems like we can go weeks without anyone engaging us and then we have a day like this where we start feeling like we are one of the activities listed in the tourist info brochure: "Have a conversation with older Americans on bicycles with too much gear." That feeling was cemented when we paused to admire the stunning views on our descent into Corvara and a recently retired couple from Trieste struck-up a conversation. Theirs was the only conversation that wasn't mostly conducted in English as it began in Italian and then they switched it to German with a smattering of English. All of the attention by this string of fellow travelers combined with the beautiful weather to lift our spirits despite leaving Selva behind. We'd climbed this pass a number of times and though it had some steep grades, the mere 15 mile route made for a short riding day, which left us with plenty of time for the series of conversations. Yet another pass for the pairs of riders on the Transalp bike race. In addition to our mini-social events in crossing Passo Gardena, we found ourselves in the midst of a biking event, which is always affirming. It wasn't until doing some online research a few days later that we understood that these 550 teams of 2 riders were a part of the Jeantex Bike Transalp mountain bike race. They were covering 600 km or 385 miles and accumulating 19,500m or 65,000' of elevation gain in 8 days as they traversed passes in Germany, Austria, and Italy. We hadn't known it was a multi-day event when we saw them but we knew that they were getting tired as the pack was spread out over about 4 hours and we saw a dozen or more riders giving their partner a little push as they rode up the pass we were descending. 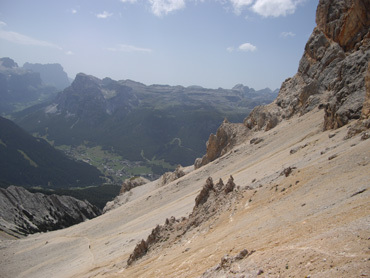 As when in Selva, Bill had a couple of Via Ferrata hiking routes on our Corvara itinerary. While on one of these outings I reflected upon how taking up the sport of hiking on these trails with stretches of steel security cables had delivered unexpected gifts to us. Bill became increasingly aware of them from the denotations on the hiking maps when we started visiting the Dolomites 6 years ago and they piqued his interest, despite being mildly afraid of heights. 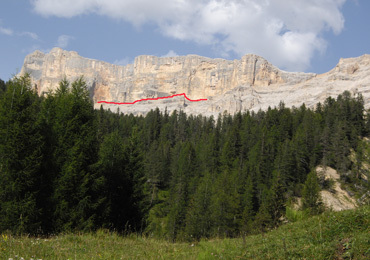 Our Via Ferrata trail followed the red line at the base of peaks. I wouldn't have bothered with them myself because of the overhead involved: buying and carrying equipment; hiring a guide to literally show us the ropes/wires; and learning how to select appropriate routes. But Bill was motivated and I knew my yoga background would give me an edge in developing the needed climbing skills, so off we went in 2006 on this new adventure. The additional hiking that summer served us well. It allowed us to linger in the stunning peaks of the Dolomites in a way that we couldn't on bikes. 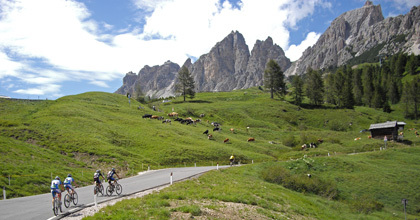 The Dolomites are a relatively small area that is too easy to zip through on bikes: strong cyclists riding without a load can top the 4 most scenic passes in a single day. Being less-athletic and riding with a combined bike and gear weight of over 100 lbs, one pass a day is enough for us, but still, they click by too fast. But hiking expands the experience of them in multiple directions. Here's a closer look at that 'red line' trail. 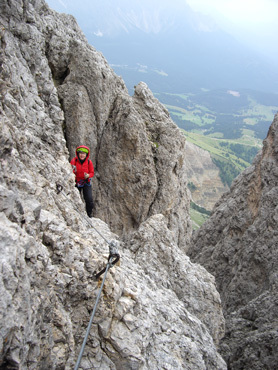 But even the Via Ferrata's are too strenuous for us to do daily. Coordinating our recovery from one route with the needed favorable weather for the next usually limits us to doing about 2 a week, if we are lucky. That means that the other days must be filled in with moderate training outings on foot that allow some recovery--which keeps the level of scenic adventures high. Bill's goal of doing hikes on the high trails afforded by the Via Ferrata's forced us to become more capable hikers. We had to considerably increase our walking speed in order to complete the 1 day routes in 1 day, especially our speed going downhill. Via Ferrata's nudged us into becoming fitness walkers and that fall when we returned home we began running almost all of our errands on foot rather than using the bus. Beginning that year, my maximum walking range at home was about 10 miles round trip per day, with a minimum of 2 hours of walking being my daily target. of the peaks & the sloping mountain bases. Becoming fitness walkers/commuters and more serious hikers required unexpected soft tissue changes in my legs and hips. For years I had been aware that I was inordinately fatigued after about 90 minutes of walking but didn't understand why. The demands of our increased walking in 2006 made me realize that some combination of my ligaments, tendons, and muscles needed to adapt to the stresses of walking longer distances, just like when an experienced fitness runner decides to become a marathoner. It usually takes about 6 months of training for the soft tissues to completely adjust to a new sport, or a new variation on an old sport, and that was the case with distance walking for me. The demands of the Via Ferrata's nudged me past this previously misunderstood barrier in walking, which greatly increased my endurance and comfort. 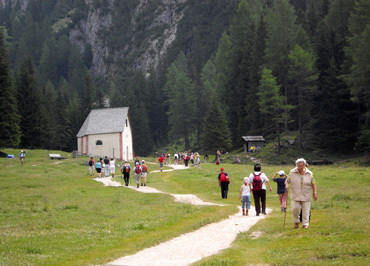 Longer walks that had been distressingly uncomfortable were no longer an issue--boredom was now the only barrier and that wasn't ever a problem in the Dolomites. A totally unexpected ego boost that came from developing our hiking skills was more accurately understanding our level of CV fitness attained by cycling. When people chat with us and say "Oh, you must be very fit" we always cringe a bit and don't really know what to say. We both have strong legs and are very experienced cyclists, but just how fit are we? When back home it seems that every commuter on a bike passes us with ease, even when we apply ourselves, so we don't feel all that fit. But hiking told a different story. We were both stunned when we discovered last year that we could blast up a 2300' steep face in Selva in just over an hour. The experienced hikers on the trail would be plodding along, taking long breaks to catch their breath, some looking like they were about to keel over. Our heart rates would surge into the 160 range and we'd be dripping with sweat, but rest breaks were optional and we'd arrive at the top beaming with the pleasure of the exertion sensations and ready to do more. It was just such hikes that definitively told us "Yes, you are fit" in a way that wasn't apparent when we huffed and puffed up similar elevation gains with multiple rest breaks on our loaded bikes. The Via Ferrata's were added to our repertoire to give us more dramatic views of the mountain peaks but they've given us much, much more. They'd given us new sports of high elevation hiking and fitness walking; they given us a more straightforward way to monitor our level of fitness; and they'd given us a way to deepen and lengthen our pleasure of being in the Dolomites each summer. And the extra challenges that hiking brings to our bodies had retooled our balance, coordination, and confidence--all things that can easily wane in one's late 50's instead of get better. 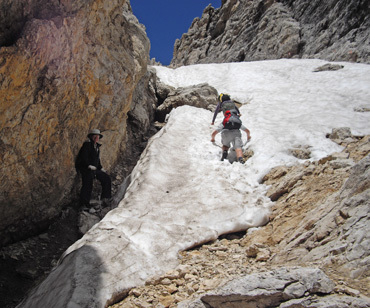 This was the easy snow traverse near Piz Boa. 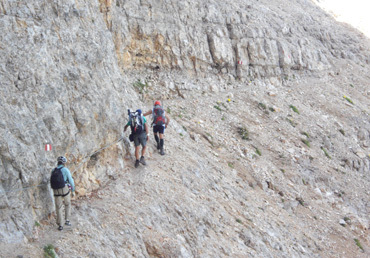 This year's Dolomites hikes, with or without Via Ferrata segments, delivered more thrills and chills than in the past. More outings included unexpected snow field traverses and we spent more time scrambling on all-4's than we usually do. On one day it was the big expanse of snow early in the route that required more care with our footing and after lunch it was the snow lingering in a deep little ravine that added more adventure than we we wanted. 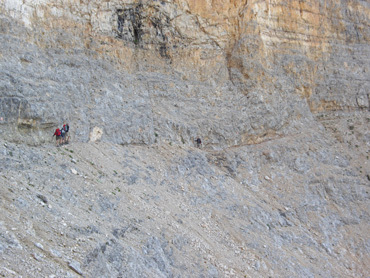 Bill had carefully crafted this route above Corvara around Piz Boa to carefully avoid the difficult Via Ferrata segments on either side but ultimately we regretted not having our gear with us that day. We, and the other dozen hikers on our route, were stymied at discovering that the only non-Via Ferrata way down off the face was through a narrows that was packed deeply with snow. It didn't matter whether people were needing to go up or down this segment, it gave all a pause. We watched as some groups tested the route and turned back. One young German couple sat at the bottom of the difficult area for close to another 20 minutes after we arrived while the hesitating man fortified himself for the ascent (or re-ascent?). What had been a long though relatively easier hike for us became another confrontation with "How did we get ourselves into this?" Bill pausing once the worst was traversed below Piz Boa. Even one of those seemingly local, "2-legged mountain goat" guys that whiz by us stopped and did a double take. He landed on his bum as he descended by ramming his heels into the soft snow and then retreated to re-evaluate the situation. Presumably he, like us, didn't know what the footing challenges would be like at the bottom of this snow field. This experienced hiker finally settled on climbing down the rocky gap between the deep snow and the face. He advised us against doing the same on the other side of the snow field which had looked better to us and we accepted his guidance. We did however decline his kind offer to assist us--it was hard to imagine what more he could do as it was strictly a matter of picking our way down one foot and one hand hold at a time. On another hike out of LaVilla near Corvara, it was the descent in high winds on an extremely steep scree field that made the visually dramatic Via Ferrata part of the route seem simple and straightforward in comparison. It was a long, tedious process of testing each step and avoiding picking up speed when there was little hope of slowing that made it challenging. The mentally and physically trying scree-phase of the descent felt like an eternity though it probably only took about an hour. Our scree-field trail is barely visible at the bottom of the photo. Wash-out areas on trails are always a problem even though overall the trails in the Dolomites are well maintained. Perhaps it only seemed like there were more wash-outs for us to pick our way through this year because we were having more challenges with the wind, thunderstorms, and snow. But nonetheless, missing stretches of trail added a bit more danger to our hiking than we go looking for. Later in our Dolomites stay, when we had parked ourselves at Tiers/Tires so as to hike in the Rosengarten-Latemar area, we again got caught in a storm. About an hour into our 8 hour outing we were hit with the on-again, off-again phase of the advancing weather system. But by the time we were doing our final descent, the full-on phase had hit, a phase that would last well into the night. A bit of near-vertical rock with just-big enough hand and foot holds to pick our way down had become a sheeting waterfall. It was a new "skill-building" experience to select bits of protruding rock for support through the coursing water. At least the streaming water wasn't loaded with dirt and grit so we could still see through it. A break in the rain on a Rosengarten cable. This was the second hike in the last month where we were so grateful for our out-of-place, broad brimmed sun hats that happen to be waterproof. Pulling a jacket hood over the hat shielded our necks, glasses, and faces from the pounding rain as they had done in a terrific hail storm a few weeks before. Many of the hikers were caught out in this latest storm on Rosengarten with little weather protection and we felt safe and secure in our rain suits augmented with our big hats. While the hikers in shorts sat in the rifugio bar waiting for a break in the downpour before plopping down on the wet and exposed chairlift, we discovered that tilting our brims down to our backpacks held in our laps made a perfect bivouac against the winds. They had smirked at our get-ups when we arrived off the mountain peaks but at least we were dry and warm--and finally off the mountain--while they waited for the break in the tempest that never came. It is this point in the year when we are the most pleased, the most contented. It's the time of every year when we are at our fitness peak. We heat-acclimate in the several weeks we spend approaching the mountains--though this year there wasn't much need for heat acclimation once we arrived. Our typical sea-to-mountains approach has us being partially attitude-acclimated by the time we arrive at Selva's 5,000' elevation. And our month-long stay in the mountains allows our attitude-acclimation to increase so that we can comfortably hike in the scenic 5,000-10,000' range, something that clearly hinders many other visiting hikers. 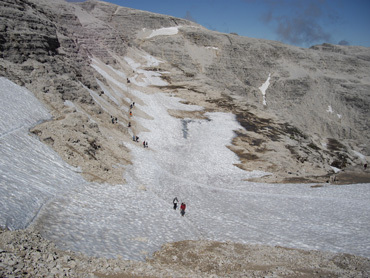 It's a thrill to be up to the challenges of these hikes. In addition to arriving with heat and altitude acclimation, our mix of hiking and biking on the steep grades this time of year has our CV fitness at its peak. And each season after hiking about 10 days, our legs become conditioned to the stresses of steep descents. So it is this extended stay in the mountains where our overall fitness is at its peak and then we get to put it to hard use day after day. It's also a time when we congratulate ourselves for our versatility with our gear. Since we added hiking to our itinerary in 2006, we've learned how to carry what we need to be safe but not burden ourselves on the bikes or hikes with the superfluous gear. Our broad-brimmed sunhats do double duty against the rays in the above-tree-line hikes and in the downpours; our $3.50 fingertip-less leather gloves from Portland provide much better hand protection on the Via Ferratas and rock scrambles than the $50 specialty gloves sold in Europe. Our micro-crampons give us compact insurance in the snow and our compromise of sharing a pair of trekking poles works out well. People give us odd looks because we aren't in the proper costumes, because we look unsuited to the challenges and yet they find themselves staring at us where they are, where they assume we can't go, like at the top of a peak. Finally, a sunny day hiking in the Rosengarten group. Just as we reluctantly leave the village of Selva di Val Gardena in the Dolomites, each year we reluctantly leave the greater Dolomites area a few weeks later. We stay a little longer each time and this year Bill extended our visit by exploring the Rosengarten area near Bolzano. The summer season is quite short in the Dolomites so we know when we arrive that our fantasy of it continuing forever isn't possible. Knowing that at some point we'll have to leave helps dislodge us, helps us to move on to explore other hiking areas in hopes of finding something even better. Last year it was the Pyrenees of France and Spain where we hiked and biked for almost 6 weeks; this year it will be southern Austria. An area in Switzerland was recommended by an older British couple this year but the weak dollar made us choke on the already higher prices there. Amazingly, our lodging prices would drop by 25-50% from Northern Italy prices by going to Austria rather than doubling if we dipped into Switzerland. On our last day in the Dolomites we boxed up our Via Ferrata gear and a big stack of Bill's treasured planning maps and booklets and sent them back home. It was a trade-off: there were some Via Ferrata's in Austria we could do and yet we longed to lighten the load on our bikes for the 3 passes we'd traverse in getting there. The last pass, Timmelsjoch on the border between Italy and Austria, is at 8,200' and it would be a significant challenge for us and we needed every edge we could get. Bill's sleuthing once close to Austria yielded the lodging information he needed to break our climb over Timmelsjoch pass into 3 days. 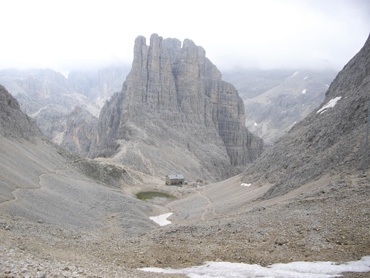 He discovered a rifugio-styled guesthouse at the beginning of a long expanse of 10% grade that would give us a second night's rest on the pass and spare us finishing the climb on our last legs. The 3 day strategy worked and we arrived in Obergurgl with the energy we needed to solve some unexpected provisions problems--problems such as these are why we try not to push to our limit. Our budget-priced but bright and cheery ski apartment coaxed us to extend our stay in Obergurgl from 5 nights to 8 and then longer to do even more hiking. The area certainly isn't as lovely as the Dolomites but the end of the hiking season is near and we want to take advantage of it. 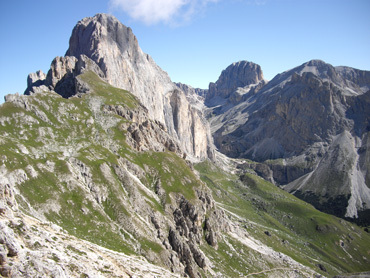 Many European summer resort areas, including the Dolomites, begin closing down on the last day of August, which still amazes and disappoints us. When we finally leave tiny Obergurgl we will spend a week biking and hiking our way to Innsbruck, a city we haven't visited. If the weather holds, we'll take advantage of the cable car based in Innsbruck to intermingle hiking with city sightseeing. Then it will be time to reassess the route to Portugal with the weather in mind.